Macri’s drive against a meddlesome judge is not only institutionally irregular but also potentially self-incriminating. This past week the news has continued to roll along familiar lines – dominated by the ramifications of the various corruption trials against ex-president Cristina Fernández de Kirchner (explosively compounded since last August by the ‘cuadernos’ notebooks exposé) and continuously bleak economic data (for the last 10 months now) – but there has been a significant new twist this month. 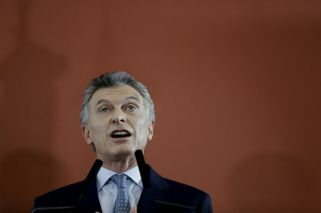 Until now these two issues have faithfully reflected the polarised politics between President Mauricio Macri and his predecessor, with the former hammering away at the corruption charges while very much on the defensive on the economic front as against precisely the opposite strategy from the Kirchnerite camp. But (quite apart from increasing signs of the middle ground starting to stir) the counter-offensive against corruption trial prosecutor Carlos Stornelli is a game-changer and suddenly an increasingly irritable president is being challenged on both fronts. It is this editorial’s aim to argue that his handling of the Stornelli issue is the more serious of these two challenges – without either underestimating the destructive consequences of this overlong recession or necessarily lending credence to the accusations against the prosecutor. Starting with the economy, the latest stats are gloomier than ever but they also need to be placed in perspective. Even if the 9.1 percent unemployment rate announced for the last quarter of 2018 is far from a record and does not match the plunges in productive output, 350,000 more jobless is always a tragedy. Confirmation of a minus 2.5 percent contraction last year virtually wipes out the 2.7 percent growth of Macri’s one good year, 2017, while fears that this month’s inflation will be even worse than February’s 3.8 percent are already mounting (driven this time by some basic foods with the least demand elasticity rather than by updating regulated prices). Yet, as Antoine de Saint-Exupéry wrote, “the essential is invisible to the eye.” Some fundamental improvements are already on the way – the elimination of the huge energy deficit with budding exports, the turnaround in provincial finances with only five of the 23 provinces in the black moving to only four in the red, the low-cost “aviation revolution” with the domestic tourism boom, etc. Yet other even more important transformations will take longer – notably the creation of capital markets and a world-class export industry true to Argentina’s potential, without which a soaring debt burden as Macri’s alternative to budget deficit becomes a time-bomb, even if relatively moderate by international standards. Returning to populism would shut the door here – thus exports are still only three-quarters of 2011 levels after three years of growth due to the devastating impact of the 2011-2015 capital controls. In a word, today’s overwhelmingly negative scenario does not strip Macri of arguments on the economic front. It is rather an even deeper transformation which runs closer to the core of the message of Macri’s Cambiemos coalition than unevenly applied pro-market economic policies – the promise of institutional and cultural change – and it is this which risks becoming damaged goods in the wake of the Stornelli controversy. We refer specifically here to Macri’s rush of blood in demanding that Dolores Federal Judge Alejo Ramos Padilla be bounced from the bench within minutes of his Congress appearance to report on an espionage ring allegedly including the prosecutor. As we have argued before in previous editorials, a president should not flout the separation of powers so blatantly and he needs his friends to tell him that as well as his enemies. The Kirchnerite-headed committee summoning Ramos Padilla was no more politically motivated than Macri’s own deputies inviting special AMIA prosecutor Alberto Nisman on the eve of his mysterious death in early 2015 – the president should be rising above such politicisation of justice instead of walking straight into it. In addition, the argument that his predecessor as president regularly leant on the Judiciary is not an acceptable excuse either. Macri’s drive against a meddlesome judge is not only institutionally irregular but also potentially self-incriminating. It would be easy enough to pick holes in some of the charges lodged by the lunatic fringe of the antiStornelli drive, who began by asserting that a coffee shared in Pinamar sufficed to quash the whole complex of corruption trials – their latest buzz presents central extortion suspect Marcelo D’Alessio as an agent of anticorruption crusader Elisa Carrió but the former seems a strange Carrió ally indeed as an Enarsa oficial for a decade directly under Julio De Vido’s Federal Planning Ministry. All this would seem to fall flat on its face were it not for the government’s strange reactions which invite suspicions of something to hide – the whole case must be properly investigated with Stornelli’s contempt of court not good enough as a response. We thus will not join the general rush to prejudge – both here and over the economy the jury must stay out.